Sega: Yakuza 3 - What about channel 4? The Yakuza series has been a long running saga starting on the PlayStation 2. It actually started fairly late in the console's lifecycle, and a lack of marketing made the first two games go overlooked by most of the Western gaming public at the time. On the other hand this was one of Sega's biggest hits within Japan since the Saturn, so they mostly focused on the home market. Western interest in the series was recently kicked into overdrive with the release of Yakuza 0 and the remakes of the first two games, and a remaster of this third game has already released in Japan. I had played the first Yakuza a couple years before the release of its modern PlayStation 4 remake, Yakuza Kiwami, so I saw firsthand what the improvements were, and the only downgrade in my opinion was the remixed soundtrack. The first Yakuza game I had ever played was Yakuza 4, which seems to be the first game in the series that received a decent amount of attention from Western audiences, but still a shadow of what Yakuza 0 and the Kiwami remakes have enjoyed. The Yakuza games are all fairly similar at the core of their design. They have quite a few progression elements borrowed from role playing games, with levels gained with some form of experience, battles appearing throughout the map rather randomly, equippable armor, weapons, and accessories, and consumable healing items as well as a buff in the form of drinking booze. The combat system is a real time beat 'em up. Each battle is against multiple opponents, with most bosses featuring one on one combat. The overall world map is open, and most of it can be freely explored as soon as the game begins. These design aspects create a rather interesting and unique action experience which makes the series hard to pin down to a single genre. On top of this base is a bursting wealth of mini games, which mostly vary from game to game. A few of these mini game staples are the games found in bars such as darts and billiards, as well as a digital version of Sega's UFO Catcher arcade claw game. Each game in the series tends to have a central mini game that is a focus of that specific game, even tying into the main story at some point. Yakuza 3's central mini game is a simple version of a golf game. This golf game is a surprisingly fun distraction, and can serve as a way to win some quick money and prizes once the player figures out the course and systems. The experience of progression in Yakuza is always two sided. These two faces are complete polar opposites, with the main story of the games always being a rather serious affair reminiscent of classical mafioso thrillers. Each game in the Yakuza series also features a large number of side quests, called 'substories' in the games, which have a much different tone. The substories range from playful to outright hilarious, poking holes in common expectations or adding storylines alongside one of the mini games featured in the game. Yakuza 3 is no different. However, in the West there exists two different Yakuza series. Yakuza games before Yakuza 4, and the ones afterwards. Before Yakuza 4 Sega would go through each game and knock out parts of the game considered inappropriate for a Western audience. Starting with Yakuza 4 this censorious stance was loosened, and is largely absent in Yakuza 0 and the remakes. Yakuza 3 feels like its more empty than playing the newer ones, as rather large areas of the map may be completely devoid of substories at certain parts of the game, when it feels like they should be there. A quick look at the one guide available on Gamefaqs shows this to be true, as this guide is based on the original Japanese release of the game. Comparing my personal list of completed substories to the available ones in this guide showed huge empty areas where there should have been substories, and an entire mini game was cut due to sexually suggestive content. I would purposely spend time hunting substories and find them until I could no longer get any scenes to fire, including playing every mini game whenever free time was available. Since Yakuza 3's remake has already released in Japan and the Western remakes have been successful, then fans can only hope that this cut content is kept inside the Western release of Yakuza 3's remaster. Yakuza 3's original localization is also quite strange, especially if it is played after the Kiwami remakes which have been more true to the original characters, events, games, everything. The most jarring of which is the name of the main character Kazuma Kiryu's adoptive father being changed from Shintaro Kazama to Shintaro Fuma, and the fact that he's constantly referred to as Fuma instead of Shintaro. Yakuza 3 is not even dubbed, its entirely subtitled, so the ears can hear the fact that the name 'Fuma' is never actually said. This just goes to show how strange and confusing a sloppy localization can end up being for fans who jump around in the middle of a series, and why original names should be kept intact. The decision seems to change from game to game as different localization teams are brought in or a different company is contracted, consistency flies out of the window. A bit of digging into old interviews seems to show that this specific decision was done to lower confusion between the similar names of Kazuma and Kazama, when the option to refer to him as Shintaro was always there on the table. It just makes no sense and makes one wonder what other strange decisions and mistakes weaseled their way into the subtitles of the game that are more easily missed. The world design of Yakuza 3 kept some ideas from the second game. Yakuza 2 added a fictional Osaka map in addition to the familiar fictional Kamurocho map. Yakuza 3 shifts the story between Okinawa and Kamurocho. The shift in perspective between the PS2 games and this first PS3 game helps each area to feel fleshed out and gives Kamurocho a new and breathtaking coat of paint. The camera now follows Kiryu close behind in a third person perspective, whereas the first two games had a fixed camera perspective that would shift at certain coordinate triggers, similar to the early Resident Evil games. Yakuza 3 gets rid of these camera transitions, giving the player direct control over the angles. On top of the new camera style there is also a first person mode that lets players search for hidden items, which are usually locker keys. Both Kamurocho and Okinawa have their own set of lockers with nice treasures hidden inside, as is Yakuza tradition. Overall, Yakuza 3 was a great step forward for the franchise when it was new. Sadly, the original feels quite dated in comparison with the newer installments, which include Yakuza 6, the prequel Yakuza 0, and the Kiwami remakes of Yakuza 1 and Yakuza 2. 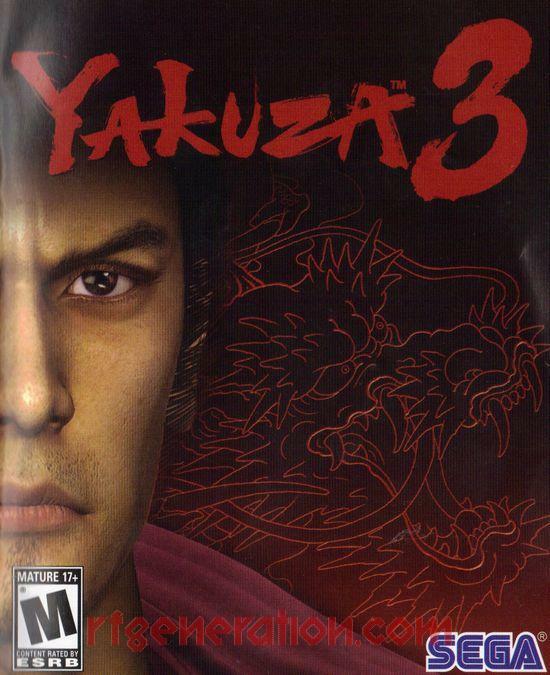 However, Yakuza 3 is more of the prototype of this newer style, and as such will feel a bit more familiar than playing the original PS2 releases for the first two in the series. The cut content is an unfortunate effect of archaic censorship policies which seem to ebb and flow over time. The more recent Yakuza releases have almost nothing censored or cut from the move from Japan to the West. All the cut content, from a mini game to multiple substories, including entire substory lines, may be the weakest part of this original release of Yakuza 3. There are times where the game just feels too empty, where the only options are fighting for experience, mini games, and looking for locker keys. In the original Japanese release there would have been more than one or two substories available during some of these open sections. Because of all this cut content and the likely Western release of a remake of Yakuza 3, any interested fans should just be a bit more patient and wait for news on this remake. It seems more likely that this cut content will be restored, and Yakuza 3 can finally be enjoyed in its full glory. Nice! Yakuza has become one of my favorite video game series over the last several years, and Yakuza 3 was my first exposure to the series back in 2010. Being my first Yakuza title, I didn't notice all of the cut content at the time, but I'd probably notice the gaps now. I'm anxiously awaiting the PS4 remaster which will hopefully include said content for the west. @Disposed Hero: There is some content cut from the Japanese release of the remaster, but it seems like some of it was based with the international market in mind. There was a quiz game based almost entirely on Japanese culture in the original PS3 Japanese release which was cut for its Western release. Its completely gone from the remaster. A more unfortunate cut is the crazy crossdresser that would chase Kazuma, this actually made it to the Western release, but is also gone from the Japanese remaster. Very detailed write-up! As someone who has never played a Yakuza game, where would you suggest I start?